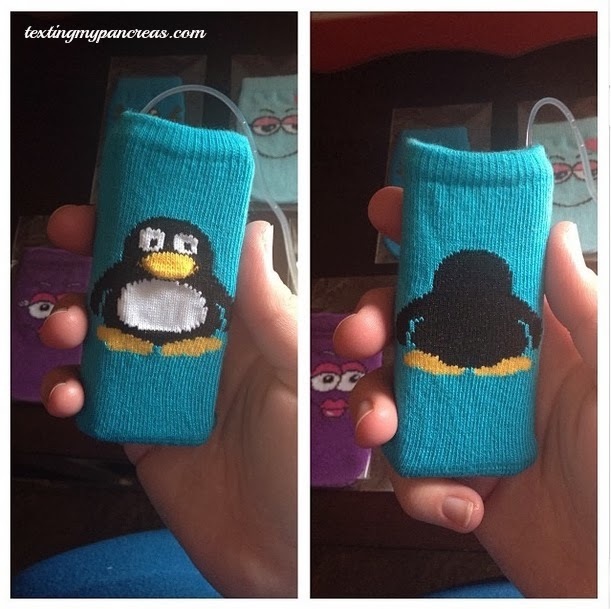 Texting My Pancreas: #GiveAllTheThings: ipSOX (Insulin Pump Sox). Raving Robin is my favorite. Super cute! I'd love Pouting Purple because it just looks happy & would make me smile when I looked at it, plus purple is my favorite color. 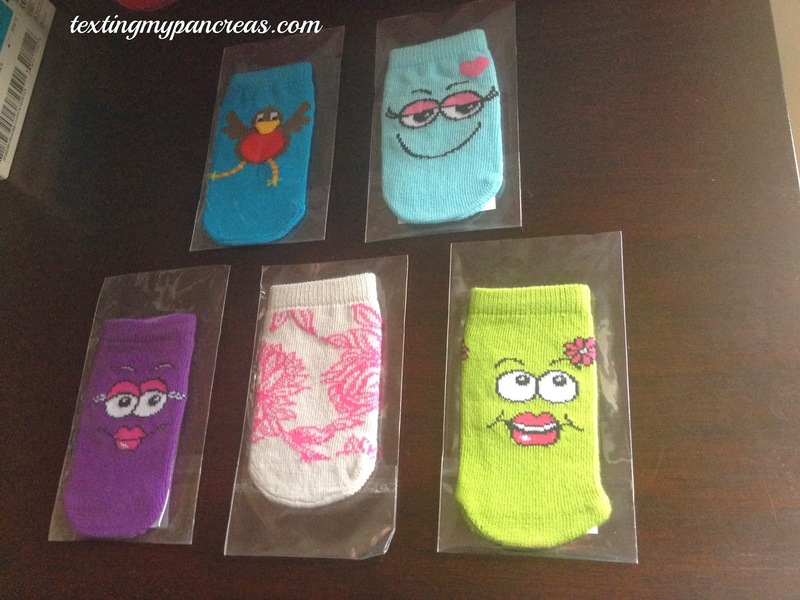 What you can win: One of five insulin pump "sox"; a stretchy cotton cover that provides protection and a little character to your external pancreas! Made possible by: ipSOX, Ltd. (http://www.ipsox.co.uk/), and I'll ship to five winners. Why you want this: I mean. I really like the ipSOX origin story - you can find it here. If you don't feel like clicking over, that's cool - I'll just copy their description: Based in the U.K., "ipSOX Ltd sells and distributes funky covers for insulin pumps that are made of a cotton/Lycra mix so that [your] pump feels soft against skin. [They are] comfortable to wear and will protect the pump, and the pump covers are machine washable. The pump covers come in a selection of vibrant colours and designs that can be matched to clothing and personal taste, and will stretch to fit any insulin pump." You could also use this for your glucose meter or CGM receiver! To enter today's contest: Use the Rafflecopter widget below to enter today's contest. You can earn two entries by leaving a comment on this blog post telling me which design you'd want (from top left, clockwise: Raving Robin, Sweetheart, Luscious Lime, Pink Flowers, or Pouting Purple. You may also earn one entry each for a Facebook Like or Twitter follow for ipSOX, which means you can have your name in the hat up to FOUR TIMES! Rules: This contest ends tonight at midnight CST, and is open only to U.S. addresses. #GiveAllTheThings contests are intended for people with diabetes (or their caregivers) only. Since the Rafflecopter widget requires you to share an email address, I'll be emailing the winner (as well as announcing them through an update on this post) Tuesday morning - you'll need to respond to me by Thursday evening (let's say 7:00 pm CST) with your shipping address in order to claim your prize. If I don't hear from you, I'll pick a new winner. Disclosure: ipSOX sent me five "sox" to give away, plus one to keep for myself. I've got to go with Pink Flowers. Cute! Not gonna lie - I actually really like the Penguin one. But ravin' robin will work too. I like the ones with faces. Especially Sweetheart because she looks devious, but I also love the colour of the Luscious Lime. Want da PENGUIN!! The robin would be fun to use or give to a friend to flip d the bird. Sorry. Had to. Hmmm, it would be a toss up between Raving Robin and Luscious Lime.